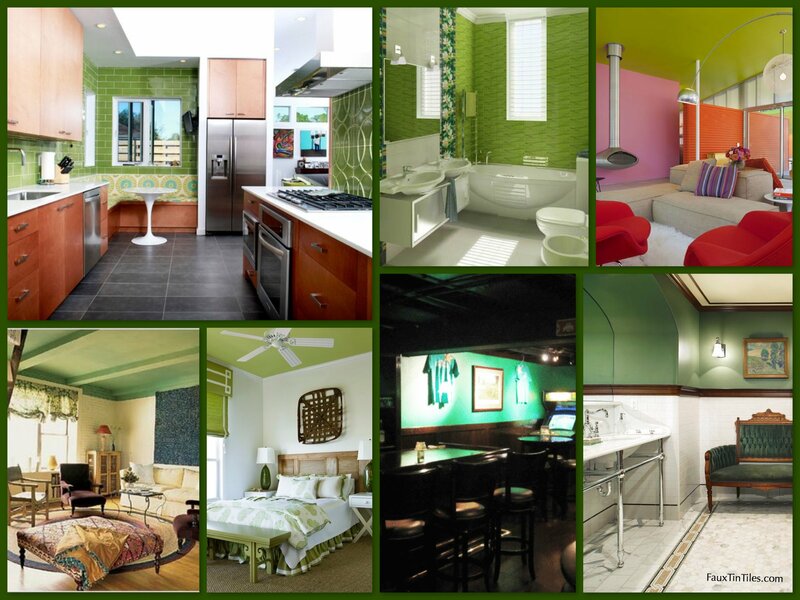 Green ceilings? Yay or Nay? 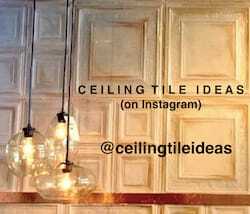 CeilingDecorating.com says absolutely yes! Although it takes a bit of leprechan daring to take the leap to green ceilings and walls, they can at once give a space a feeling of warmth and fun. Some contractors worry that painting a ceiling a color will make it look totally closed in, but the truth is quite often a colored ceiling makes a room seem much more expansive because it draws the eye upward. 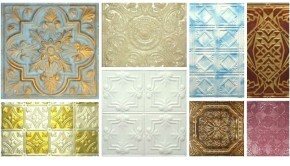 Most of the colors featured here are available on pre-finished aluminum tiles. 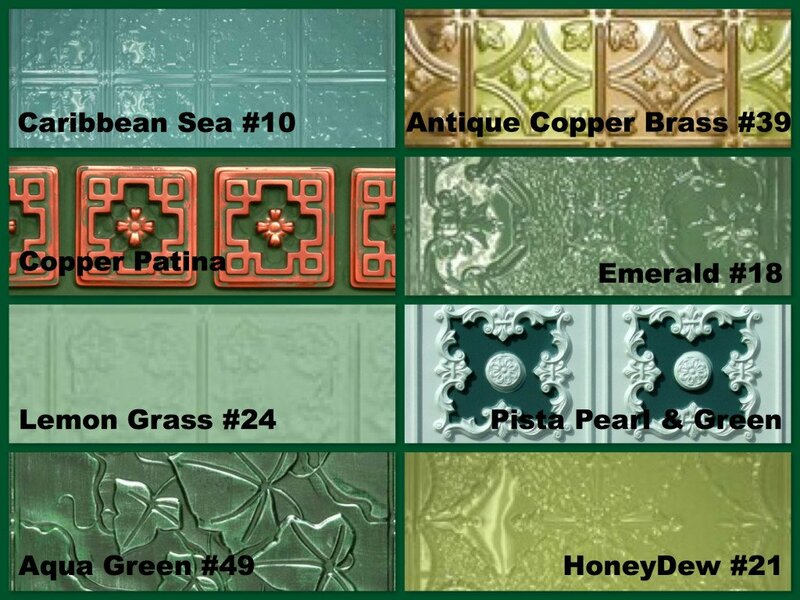 The only exceptions are the copper patina and Pista Pearl & Green colors which are exclusive to specific faux tin tiles. 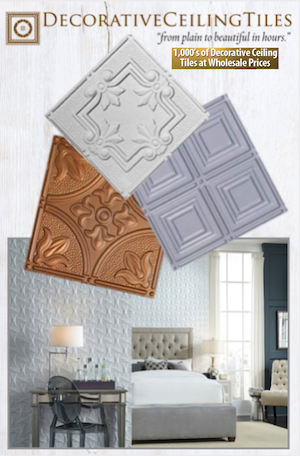 We know we are hooked on the look of tin tiles when we view the photos posted below and know for a fact that as great as the ceiling and wall applications look, every single room would be a thousand times more interesting and more reflective of today’s design aesthetic if the decorators had taken advantage of the diverse selection of decorative ceiling tiles available. People need to stop thinking paint and start thinking decorative panels especially since ceiling and wall panels can be painted just about any color, and add dimension and interest to any room. We’ve said it before and will say it again, installing ceiling tiles will transform your room from plain to beautiful in just hours. 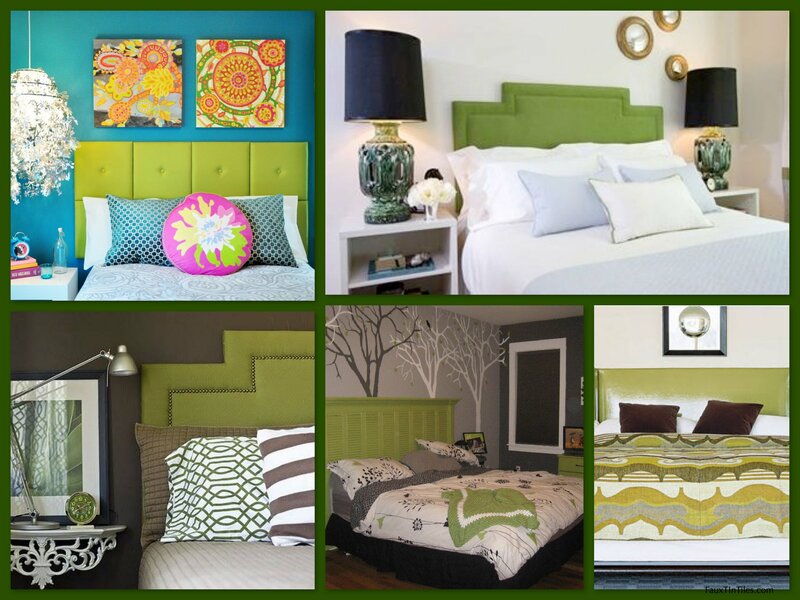 We have compiled a small photo gallery of some stylish rooms with green ceilings, walls or headboards. As you will note, tin and faux tin applications would work well with a variety of decorating styles from very traditional cabin decor to beach style to modern contemporary looks. 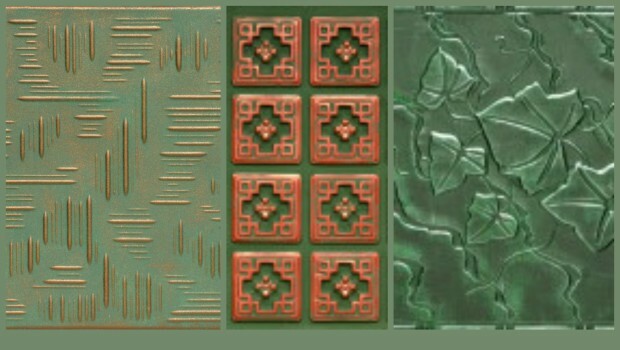 Additionally, keep in mind that just about all Milan’s tin, faux tin, and foam tiles can be painted green. You can easily do it yourself, or Milan would be happy to take care of it for you for a small fee. 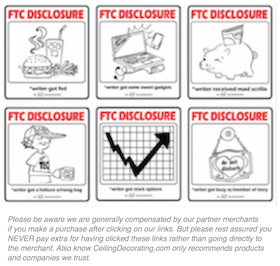 Not sure if you can see it but the top left kitchen photo actually uses a tile very similar to Circles and Stars – Foam Ceiling Tile – 20″x20″ – #R82 over the stove. 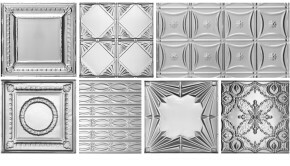 Milan, at Decorative Ceiling Tiles, is also carrying a new faux tin design which would be very cool, too – Starbright – Faux Tin Ceiling Tile – Glue up – 24″x24″ – #228. The only problem is that Starbright is not available in green so you would either need to spray it yourself or talk to Milan about doing it for you (Remember, this option is available for any tile you like!). We also love the green and white pub restroom and promise you, it would look even better if the green accents were done with decorative tiles! 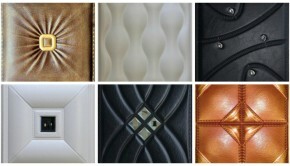 Just an FYI, clicking on the photos will enlarge them so you can see the design ideas even better. Summary: Although it takes a bit of leprechan daring to take the leap to green ceilings and walls, they can at once give a space a feeling of warmth and fun. Some contractors worry that painting a ceiling a color will make it look totally closed in, but the truth is quite often a colored ceiling makes a room seem much more expansive because it draws the eye upward.